Green Top – Tax deductible donations! Green Top sent an email out last week with another request for money. This time they want tax-deductible donations. Obviously the goal of donations is to raise badly needed money, maybe the people willing to “loan” have been tapped out. 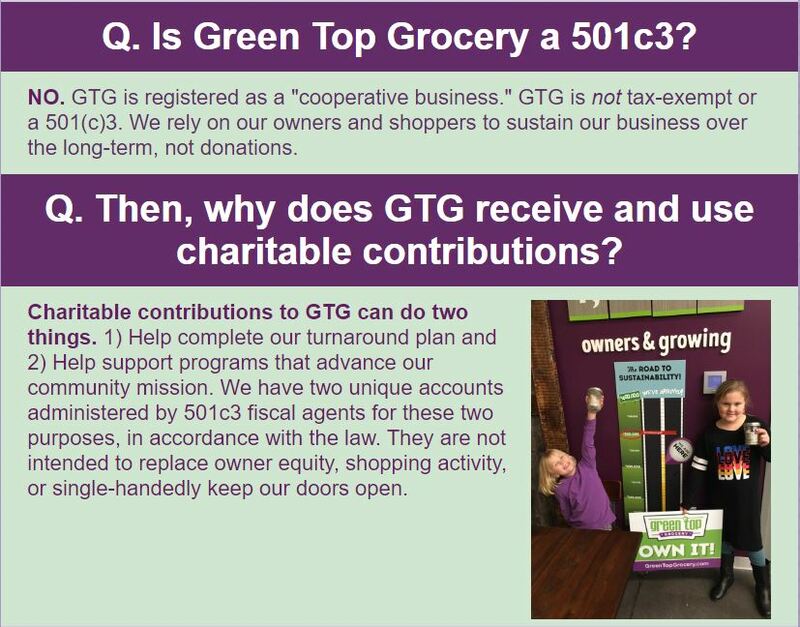 Making tax-deductible donations means taxpayers are once again subsidizing Green Top. Posted in BloNo, Bloomington, Local, Progressives, Taxes.Tagged Green Top, organic produce, tax deductible donations. They just don’t seem to get it. 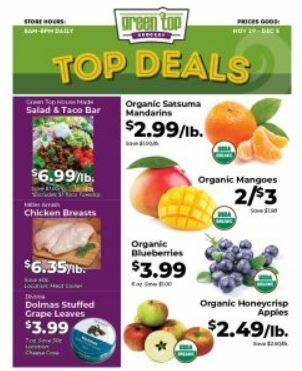 If you put an Aldi over there or even a middle-of-the-road grocery store, you would do a lot better than a place selling $6.35/lb chicken breasts and really over-priced fruit. Their “price per pound” salad/taco bar isn’t much different than you’d find in a cafeteria, but I doubt people are going to head there. Owners can “loan” as much money as they want, but I don’t see them getting repaid. Hopefully those folks who invested $5k, $10k, $25k etc. understood the risk of doing so. It doesn’t appear there will be enough equity left to satisfy the unsecured debtholders, especially if they were having trouble making their interest-only payments. Maybe the pensioners can loan money to Bloomington’s pension fund. That should keep things going, right? Naturally, the town council will level the playing field on this like they did for the hotels and the independent B&B’s. I can’t wait to be able to make my charitable – tax exempt donation to Hy-Vee or grocery store of my choice! Nope they will go the other direction and tax food grown in your home garden and consumed by you. Wow! So, Green Top needs donations (with the added help of a tax deduction) to keep the store operational. Not a surprise. Bad sign for those that have been lending them money. Of course, they were probably not going to receive a dime back anyway. Anyone donating or lending money to Green Top is an ideolog and has abandoned all reason and logical thinking. I’ve said it before and I’ll say it again, imagine if the hundreds of thousands of dollars of misallocated capital thrown down the rathole of Green Top was invested in a bunch of startups, tech companies, or other true opportunities for economic growth. Instead, in the end, Green Top will have created a bunch of temporary, minimum wage jobs from which no innovation will come of. But, I’m sure the soccer complex will be a success…hahaha! Theres are more angles in this story then in a trigonometry book! Put a HIGH end store ANYWHERE and it’s going to have a tough go in any neighborhood. People WANT value, and ALDI does has a GREAT fruit/vegetable selection and hard to beat prices. Put GTG in a NO FRILL zone-and THIS is what ya get! And as for being a tax deduction, I wouldn’t be surprised IF that claim is made on shaky ground..
As for the GTG EVER making it on it’s own, I guess they’ll have to get some economic cars from RIVIAN and offer home delivery for free..
As for the grape leaves in the ad, I can think of some NEW recipes for stuffing them.. If they get cars from Rivian someone will have to buy those for them too…oh wait, there are no cars from Rivian and Green Top will likely go under before Rivian puts out car, of course they COULD join forces since both are scams and maybe…oh the possibilities are endless once you start scamming a bunch of easy marks. Let’s see….Under the new federal tax laws deductions for this would not occur until you exceed your standard deduction I believe and itemize. So 12,000 single; 18,000 married. Then we all know Illinois provides so many avenues for tax deductions….and I am sure JB will provide more. WHO ARE THEY KIDDING? Me too! Thanks Diane, you provide a very valuable service to those who are awake.